Home Expert Advice Skincare Advice Basic Skin Care Tips Omega Fatty Acids, Ceramides, and Peptides: How Are they Different? 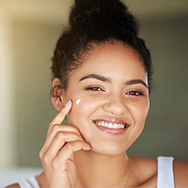 If your skin is combination to oily or breakout-prone, omegas are fine, but you’ll likely derive greater benefit from ceramides to balance lipids and peptides because of their multi-faceted benefits—especially if your skin is oily with multiple signs of aging. Speaking of signs of aging, all three groups of ingredients will bring about noticeable improvements in your skin, from enhancing resilience to diminishing the look of lines, wrinkles, and uneven texture, and you can begin using them at any age.